Dobson’s Mill, a three storey building of stone and lime, was built in 1846 on the west bank of Leithen Water on land leased to brothers John and Adam Dobson by the last Earl of Traquair. The yarn spinning business was later equipped for dyeing and weaving. In 1858 a feu with water rights in place of the original lease was granted to John Dobson. In the 1860s the factory contained three sets of carding-engines, 34 power and hand looms, and about 2500 spindles. Just below 100 people were employed producing tweeds, tartans and a variety of fancy shirtings. By this time the power from the water-wheels was being supplemented by steam. John Dobson died in 1869 and the factory passed to John Dobson (jun.) and James Wood Dobson. Unfortunately, they went bankrupt in 1879 and the factory was sold to G.A.D.C. Ferguson. Ferguson adapted the mill for the manufacture of silk thread, employing skilled men from the north of England in its production. In 1884 his trustees transferred the ownership of the factory to Captain Charles R.K. Ferguson who eventually sold the failing business to John Ballantyne of Stoneyhill, Walkerburn, and the head of Henry Ballantyne & Sons. 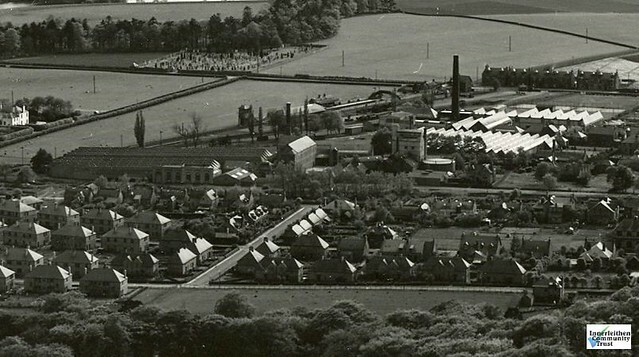 This factory and an adjoining small hosiery mill (Wood’s factory) became incorporated into the Walkerburn firm and were subsequently known collectively as Leithen Mills. The mill reverted to the spinning of woollen yarn. Walter Smail, who was related through marriage to the Ballantynes, leased the factory for a number of years but apparently he, too, got into financial difficulties. Early in the 20th century the Ballantynes resumed control of the mill, known as Leithen Mills Spinning Company, enlarging and modernizing the factory for spinning and weaving woollen yarn. After the First World War cashmere yarn was spun for Caerlee Mill (belonging to D. Ballantyne Brothers) at the time the latter was starting to manufacture knitted hosiery items. In the early 1960s the mill employed 60 people engaged in the spinning of animal fibres such as cashmere, wool, alpaca and vicuna. The yarn was sent mainly to knitwear companies in Scotland and England (Third Statistical Account). In 1981, following the takeover of Henry Ballantyne & Sons by Laidlaw & Fairgrieve production at Leithen Mills ceased and all the machinery was transferred to Walkerburn. The mill was demolished in 1991, the final act being the spectacular collapsing of the 100 foot mill chimney.